Polyester outer with polyester lining.Classic cut. Double front closure, cross surcingles, fillet string. Super nice, very light stable cover, sits very pleasant. Handy for under my Amigo rain blanket without linersystem. 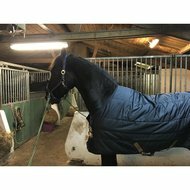 I use this blanket (size 152) for my shet / welsh pony of 1.17m. For her, the fit is ideal: close neatly at the neck and is not too long at the belly (no 'dress') but certainly not too short. The fabric is very smooth and smooth, but remains very stable. Note: it is really a stable blanket (without tail flap) and not waterproof. The blanket is 150 grams, but felt pretty thin. My pony stays there until now well warm at night. Question: Can you attach a neck to the ceiling? Answer: No, there are no fasteners for a neck piece on this stable blanket. Question: How many grams is the blanket? Answer: This is 150 grams lined.